China's individual and small- and medium-sized institutional investors have been allowed to purchase local government bonds over the counter at commercial banks, according to the Ministry of Finance. Two new bonds were separately issued Monday by the Ningbo city government and Zhejiang provincial government, including a three-year land reserve bond with an interest rate of 3.04 percent and a five-year special bond for shantytown renovation with an interest rate of 3.32 percent. The bonds involve aggregate counter sales of 1.4 billion yuan (about 209 million U.S. dollars). Sources with the ministry's Department of Treasury said the move was to broaden the channels for local government bond issuance, meet the investment needs of individuals as well as small- and medium-sized enterprises and enrich the national inter-bank bond market over-the-counter business varieties. A statement from the ministry said that the public offering of general and special bonds by local governments can both be made over the counter at local banks. Special bonds, however, will be prioritized so as to stabilize investment, expand domestic demand and strengthen the weak links of economic performance, said the statement. The provinces of Sichuan, Shaanxi and Shandong and the municipality of Beijing will soon start local government bond issuances over the counter of commercial banks. Previously, local government bonds were only sold and traded on the interbank bond market and on the domestic stock exchanges. 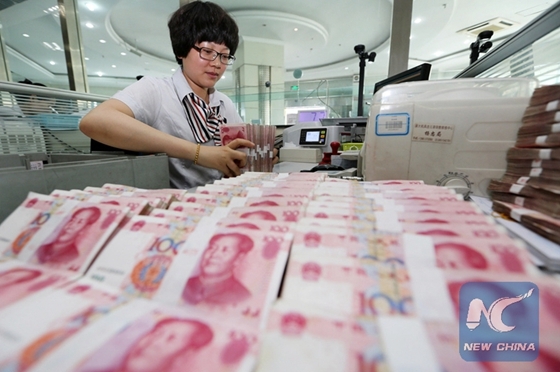 A total of 782.1 billion yuan (117 billion U.S. dollars) of bonds were issued in the January-February period. By the end of February, their outstanding debts reached 19.14 trillion yuan, below the official ceiling. The bond issuance in the past two months was earlier and higher than a year ago, said Tang Linmin, a researcher with China International Futures Co., Ltd., predicting the volume will surpass 1 trillion yuan in the first quarter. As the country has accelerated the issuance of local government bonds, Finance minister Liu Kun expected the issuance of 3.08 trillion yuan of new bonds to be completed by the end of September. ​China's individual and small- and medium-sized institutional investors have been allowed to purchase local government bonds over the counter at commercial banks, according to the Ministry of Finance.